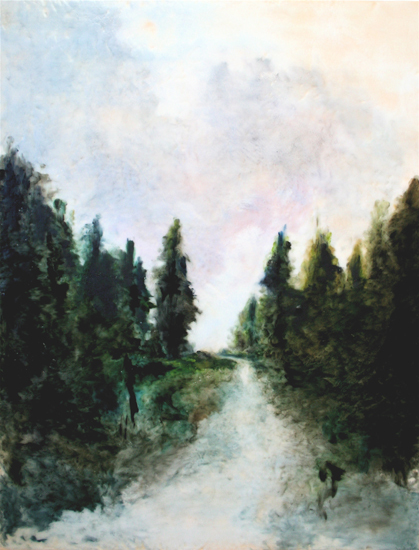 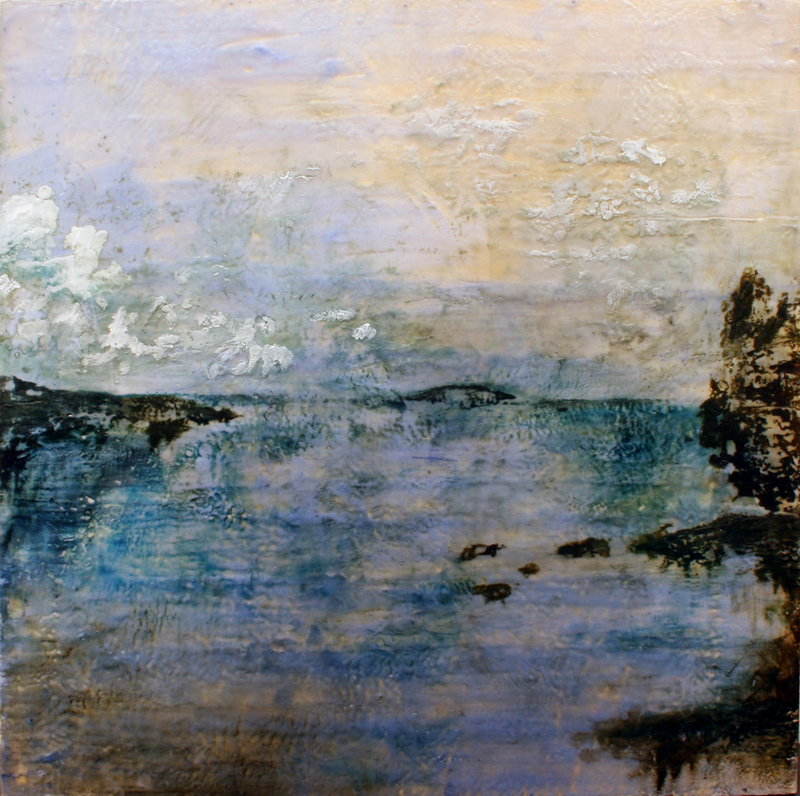 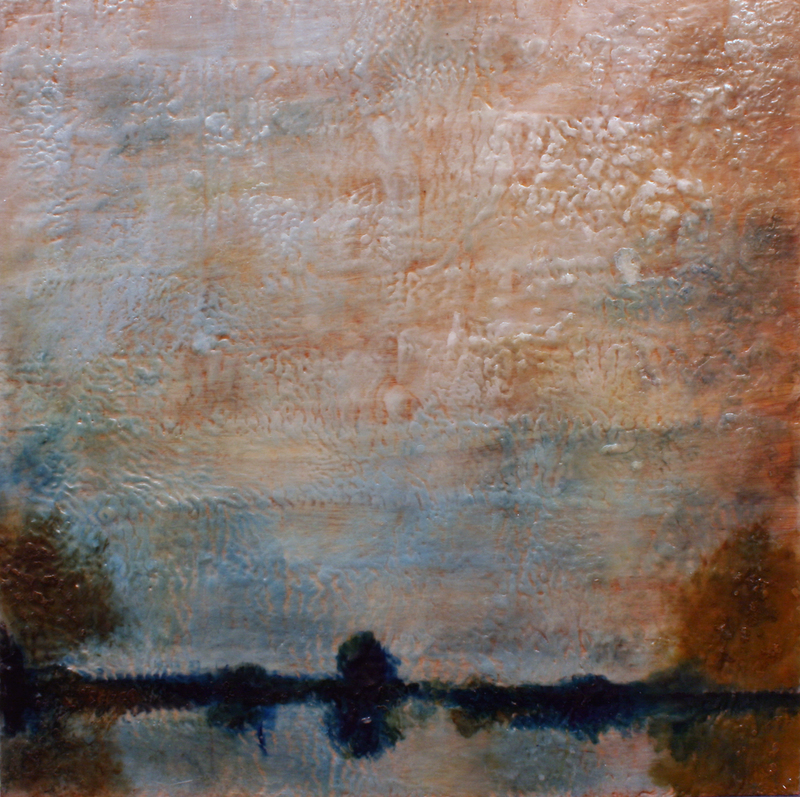 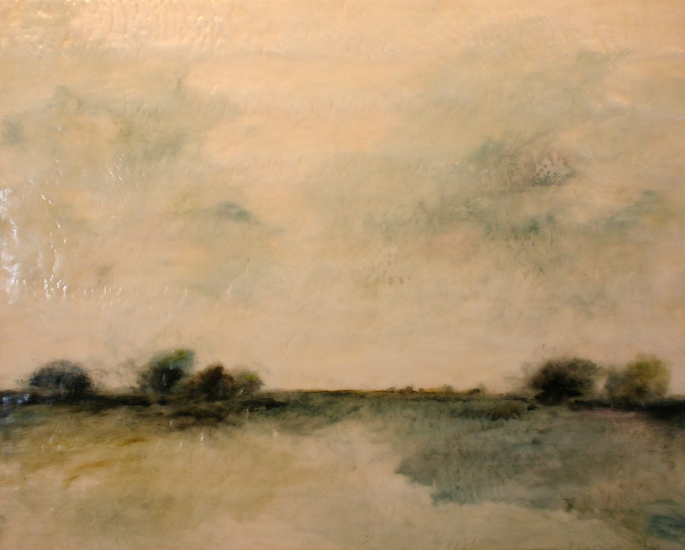 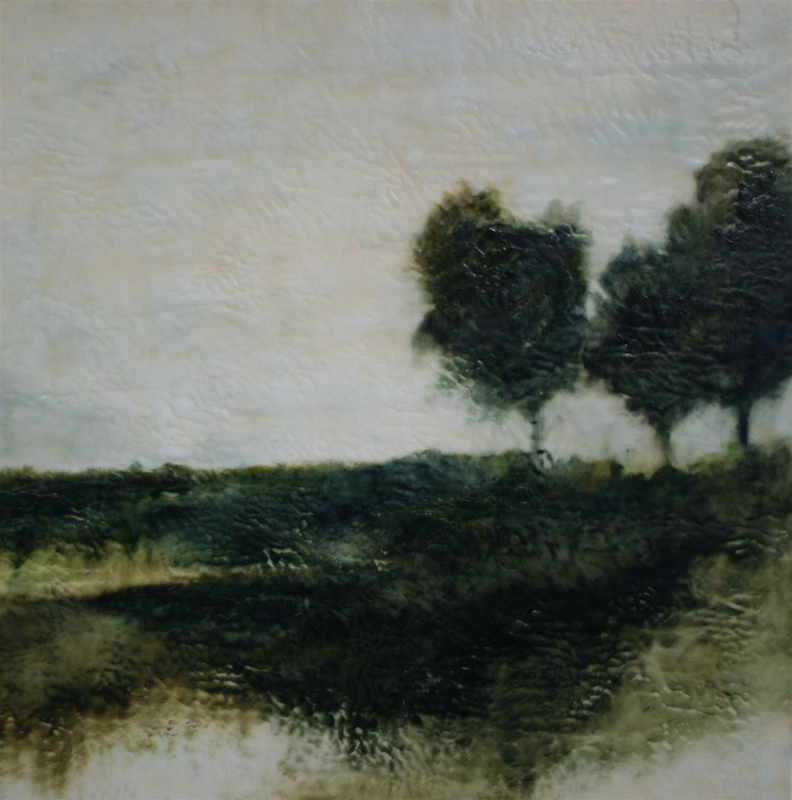 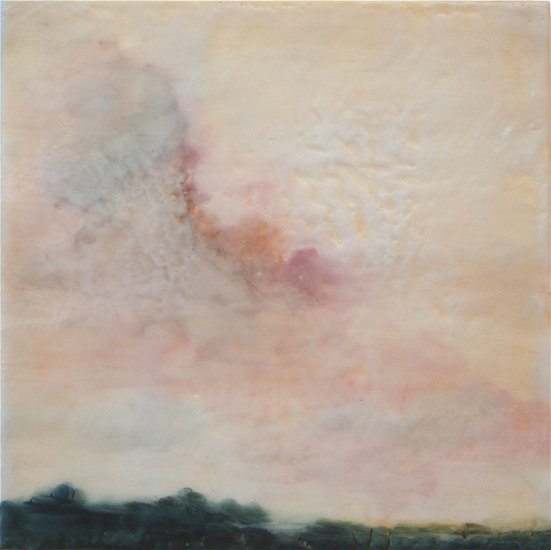 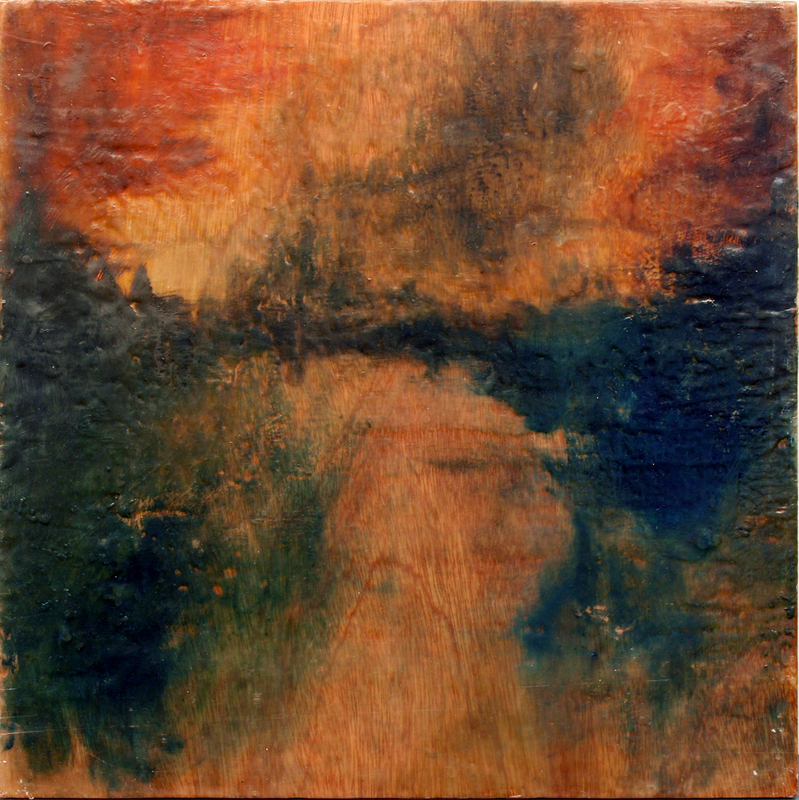 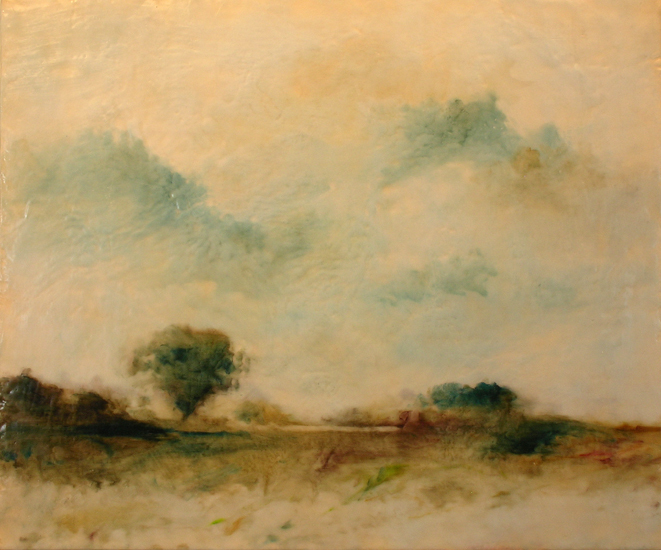 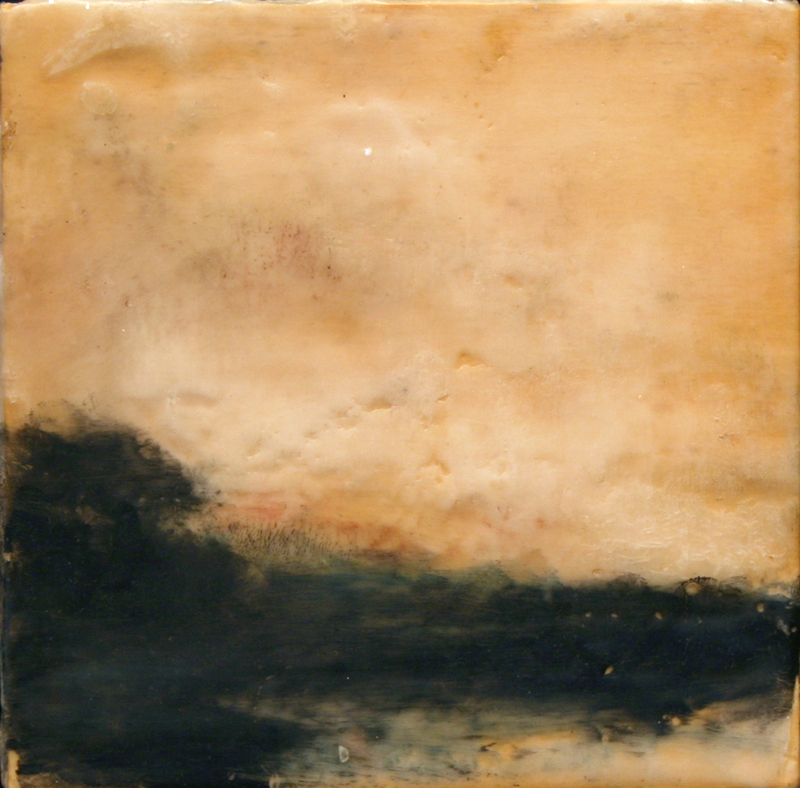 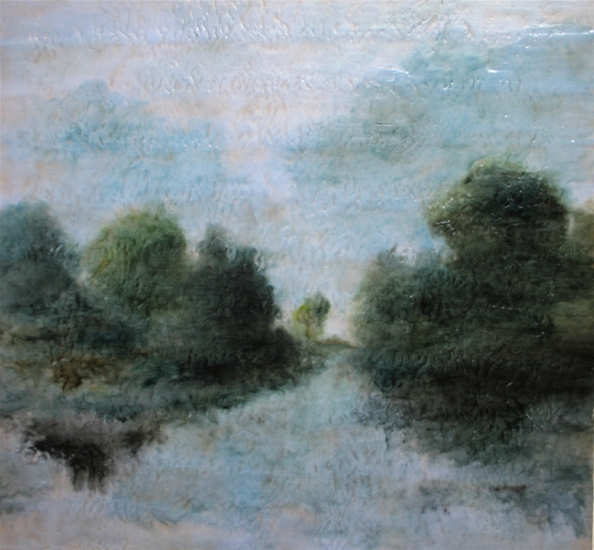 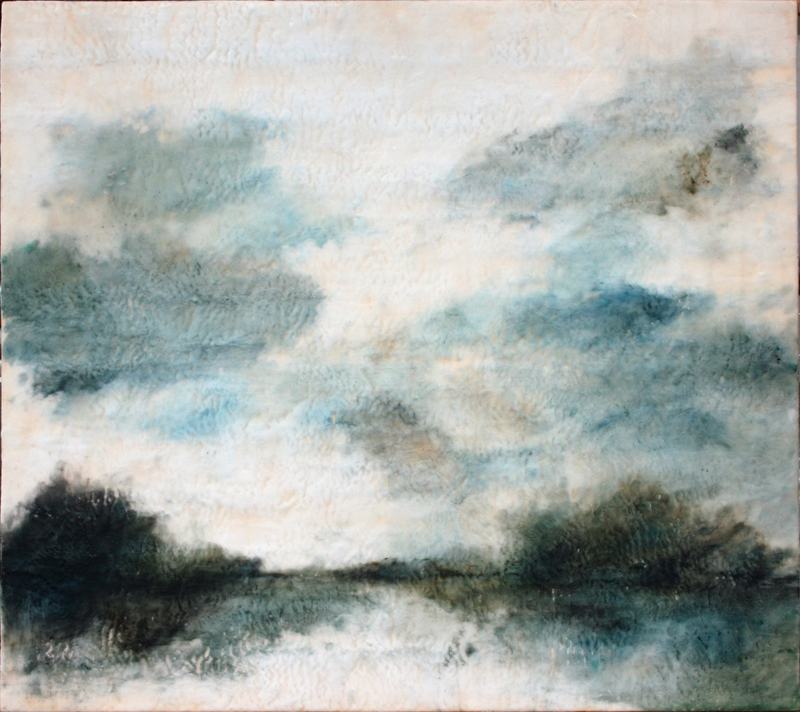 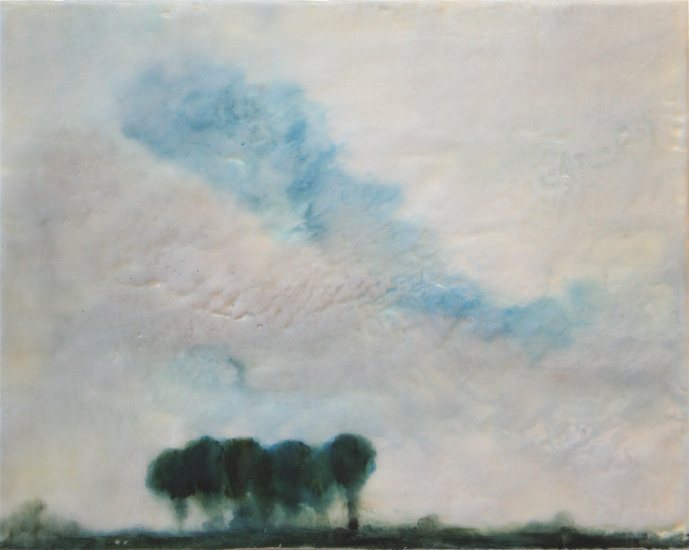 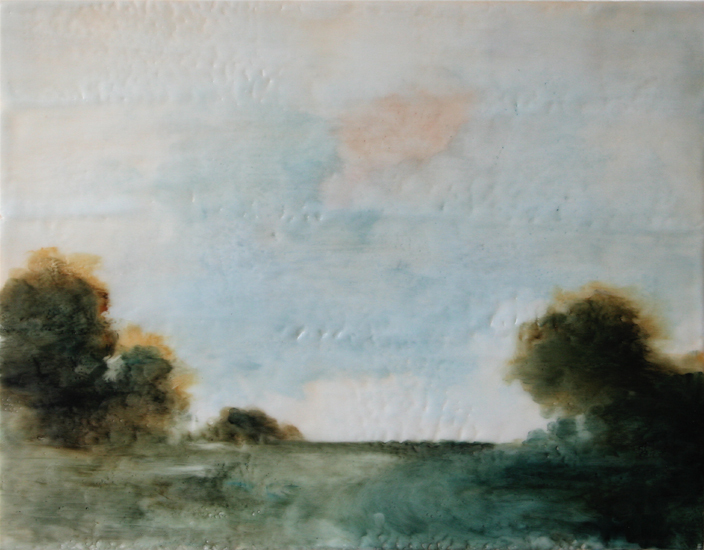 Encaustic painting is an ancient medium in which pigment is applied in layers of melted wax. 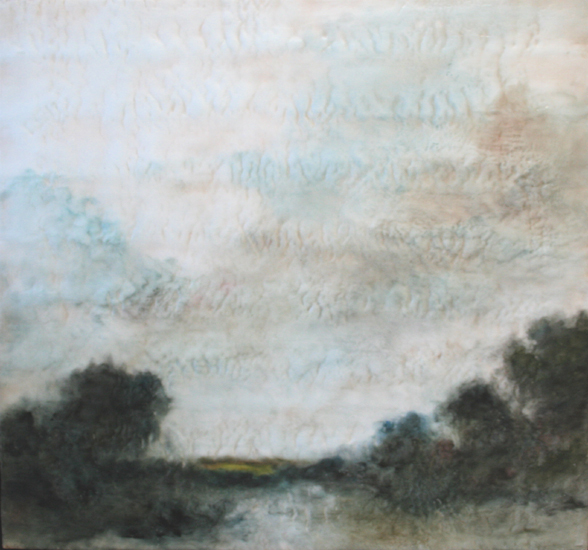 It can be a floating veil, gauzy and satin smooth, or, it can be something infinitely more primal, ropey as a lava flow — just as it is in my landscape images. 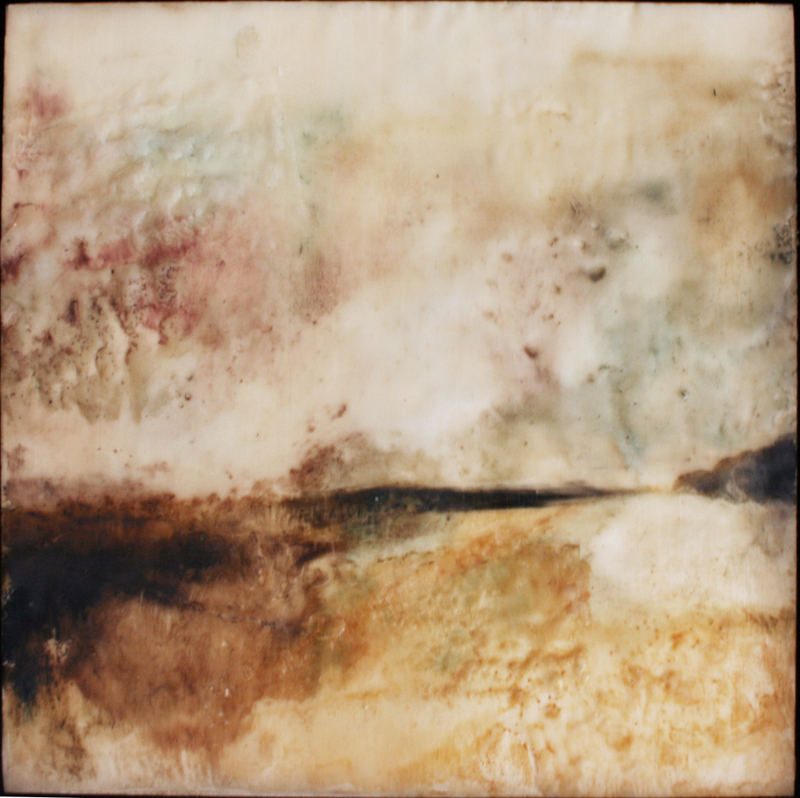 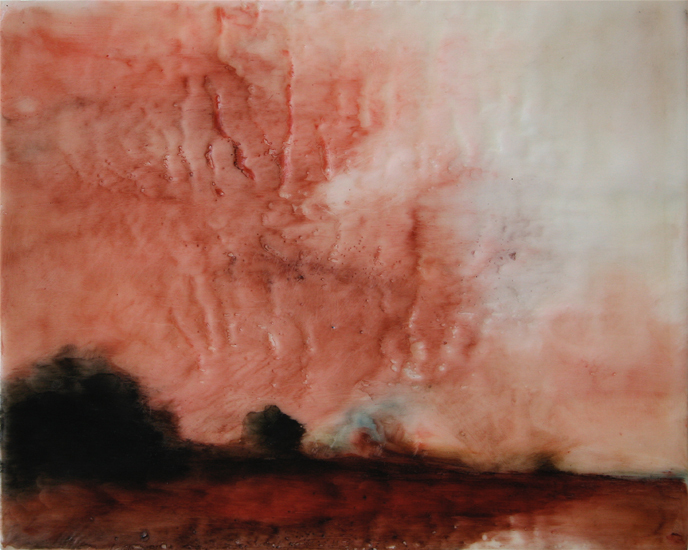 I create with a mantle of encaustic so thick that it takes on the quality of sculpture, as if the landscapes have only just erupted, half molten from the earth’s core and are even now solidifying in thick, swirling eddies. 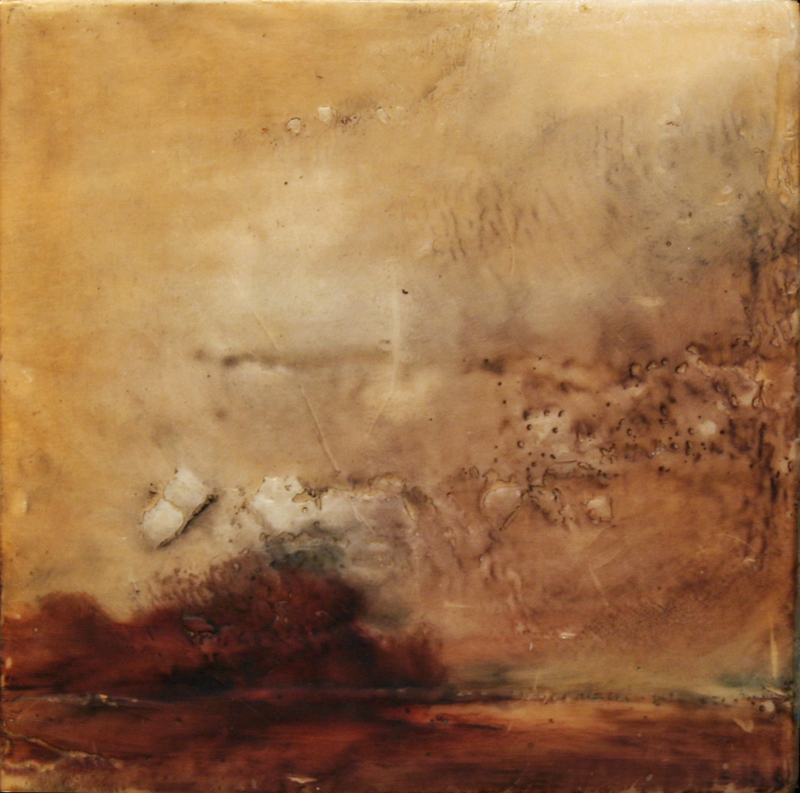 You feel tectonic forces at work, in these corroded landscapes of iodine and angry orange — forest vistas abraded to the point of erasure, glowering with pin pricks of colour where some older, hotter intention shows through; or clouds of ash and steam and showers of sparks against vermilion skies, like a glimpse into Vulcan’s forge. 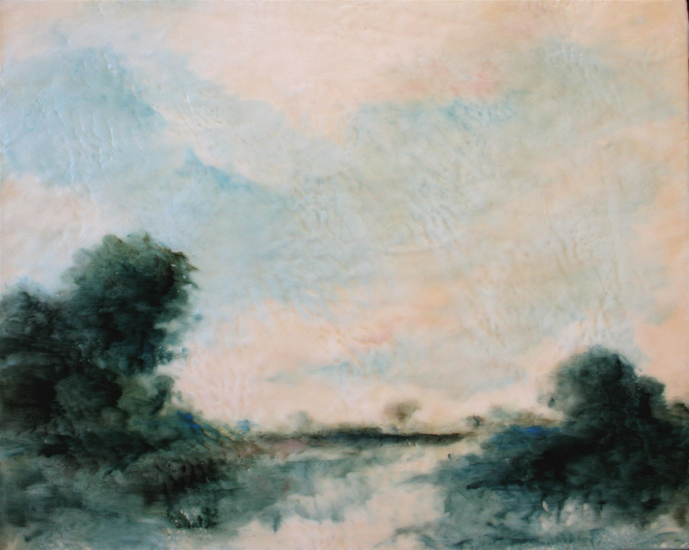 Even the more settled landscapes — a view of dusk-dark trees along a river’s back water, for instance, or, an estuary reaching to a line of barrier islands and the distant sea beyond — writhe beneath a quilted blanket of wax. 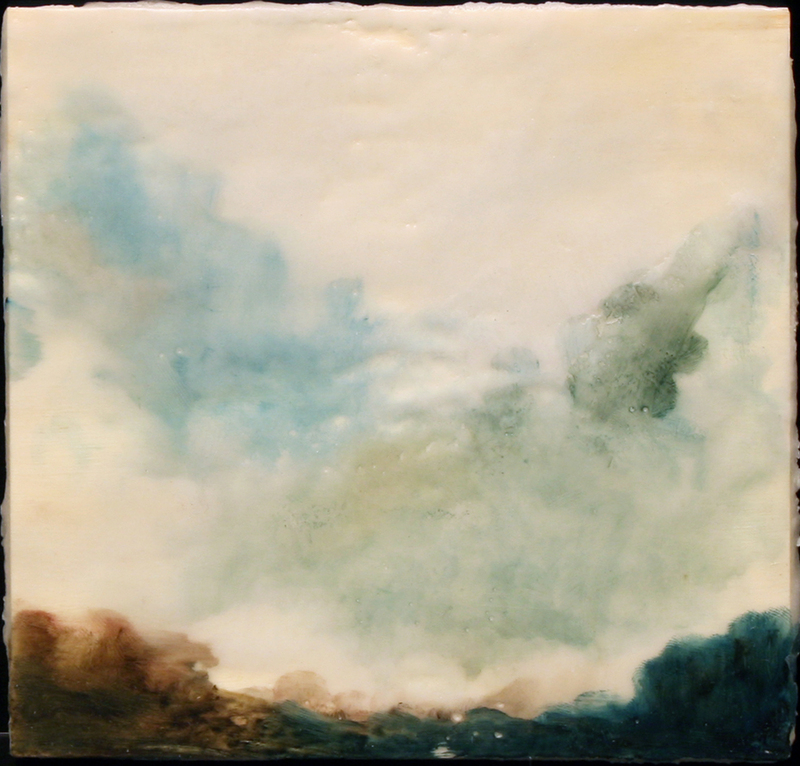 In my encaustics, the physical act of painting may be finished, but the recorded movement of arm and brush hovers, as if still ongoing. 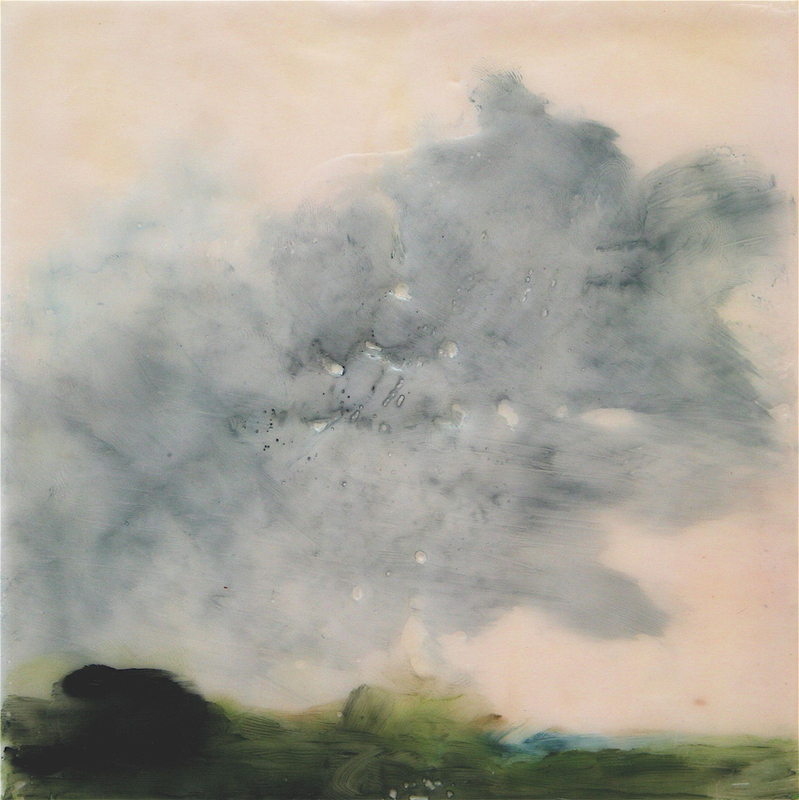 Skies well up and pool, like the great arcs of liquid that they are; water surfaces scud beneath unseen breezes; and veils of texture pour down with a liveliness that pigment alone, with its opaque nature cannot duplicate. 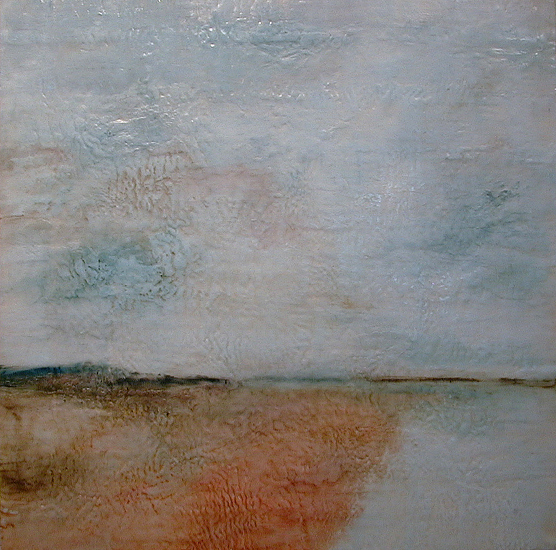 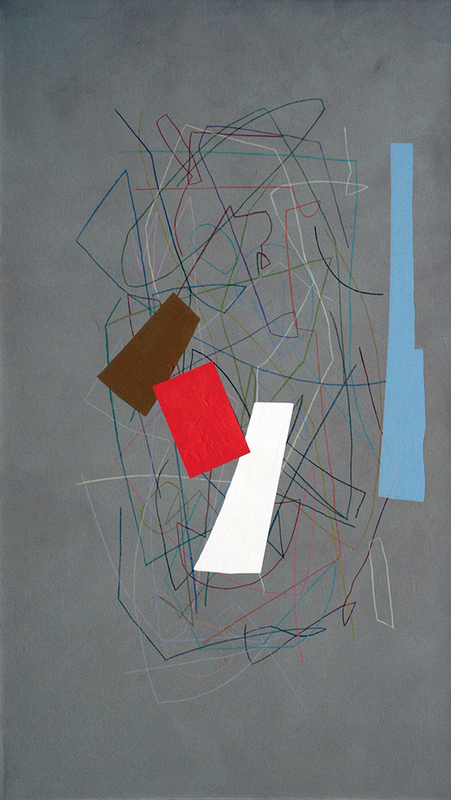 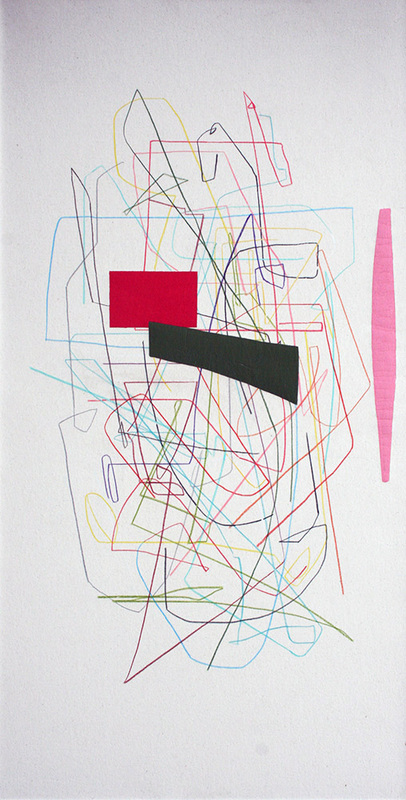 With my painting I try to say something about the ephemeral, capturing a moment of observation. 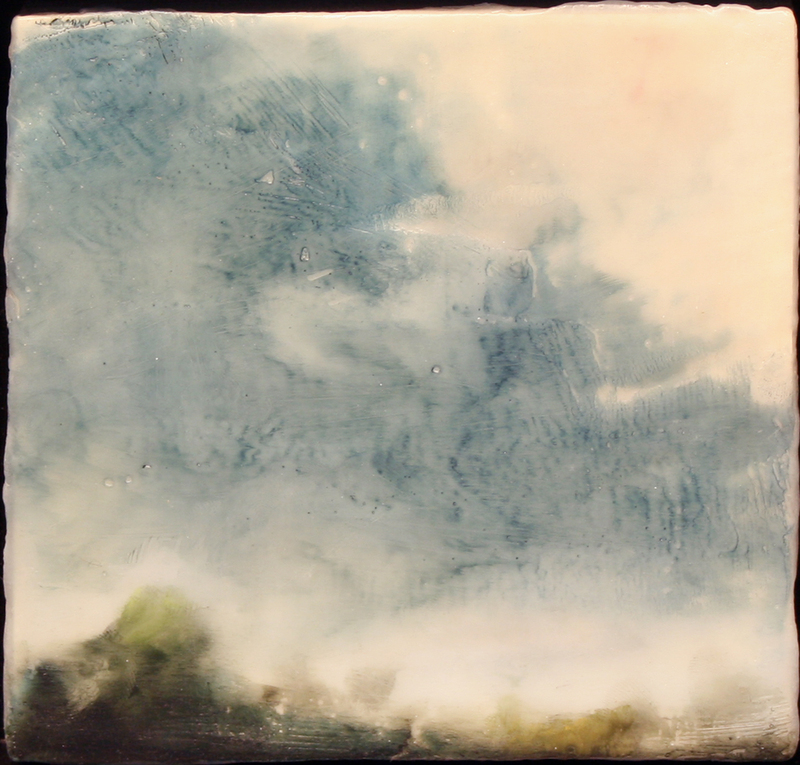 What fascinates me most about nature is that it is never static, and that any single instant, well described, can embody so many human emotions. 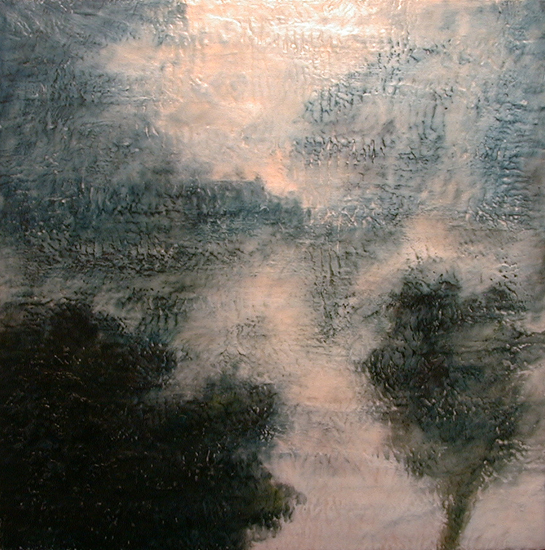 And that every observed moment is trembling on the cusp of becoming something else. 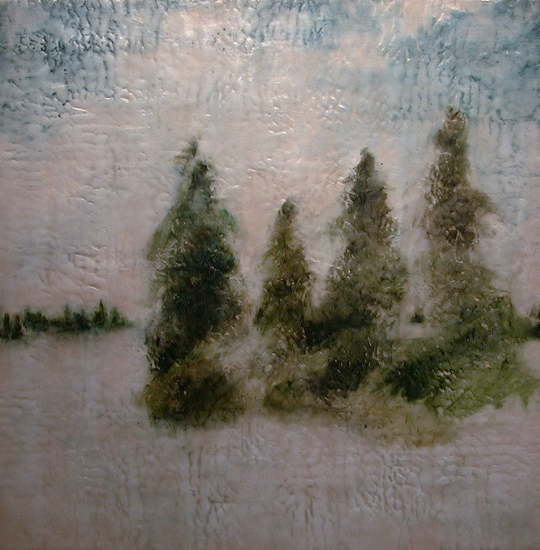 numerous private collections in: Montreal, Ottawa, Toronto, Vancouver, Copenhagen, St. Petersburg, Paris, Boston, Fort Lauderdale, Los Angeles. 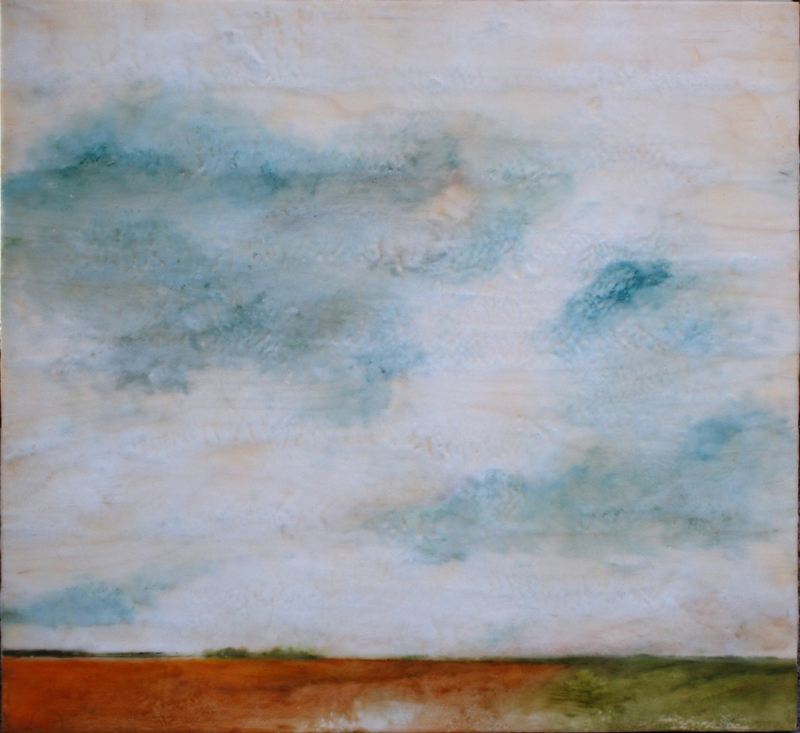 Palm Springs, and Portland.